When calling to request review copies of books, columnist Nat Hentoff always has kind words for Cambridge; something that’s lovely to hear from a writer of his stature. 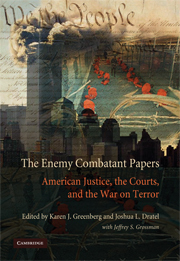 Among his favorite books of ours are Karen Greenberg and Joshua Dratel’s Torture Papers and Enemy Combatant Papers, our publication of the official memos and legal papers pertaining to detainees of the War on Terror. Hentoff’s long string of pieces urgently calling for an end to US torture use them well, as yesterday’s WorldNetDaily piece shows. I am still skeptical that our new president will – or can – fulfill all his sweeping promises, but he has made an essential start by bringing the CIA back into our rule of law by appointing Leon Panetta as director of the agency. It is significant that next to the New York Times Jan. 5 front-page story on his appointment was an account of a six-year imprisonment, with torture, of a Pakistani first “rendered” (kidnapped) by the CIA and now released without ever having been charged with any crime. Critics of President-elect Barack Obama’s choice charge that Panetta has had no direct experience with the CIA or other intelligence work. Actually, as Fred Kaplan reveals in Slate (Jan. 6), while Panetta was Bill Clinton’s director of the Office of Management and Budget, “he was one of a very few people who knew about all of the covert and special-access programs” – and he knows where to find the buried line-item budget items concerning the CIA. Bush and Cheney have deeply shaken the world’s – including our allies’ – belief that we are, indeed, different. The president-elect made another equally vital appointment that introduces the CIA to our Constitution. Beginning in 2002, it was at the Justice Department’s Office of Legal Counsel – which advises the president, the attorney general and others in the executive branch on constitutional matters – that torture became U.S. policy, and other violations of international treaties and our own laws against cruel and inhumane punishments were also legitimized. In the Obama administration, the head of the Office of Legal Counsel will be Dawn Johnsen, University of Indiana constitutional law professor, who previously served there under Clinton. She is convinced, like Panetta, that we can and will overcome terrorists by refusing to resemble them in any way. Before I continue in the next column to indicate the possible impact of these two appointments in markedly improving our intelligence services, here is a partial list of the specific war crimes in international law and our own statues that have been committed during the past eight years, and before, by highly EXPERIENCED CIA officials and their agents in the field. Neither Panetta nor Johnsen has committed any war crimes. Moreover, the U.S. War Crimes Act of 1996 makes it a criminal offense for military personnel to commit the war crimes I have cited from the Geneva Conventions. That law was passed by a Republican-controlled Congress. That’s waterboarding, Mr. Departing Attorney General Michael Mukasey. Instead of aiding the enemy by disclosing these methods of interrogation specially authorized by George W. Bush, this sunlight will make Americans and the world believe we are indeed a government of laws, not of amoral apparatchiks. As Panetta said last year in the Monterey County Herald, President Bush “is using fear to trump the law.” Doing this is just plain unAmerican, and history will not absolve that administration.